For biochemistry and molecular biology major Sarah Thompson, throwing a football has pushed her closer to fulfilling her dreams. 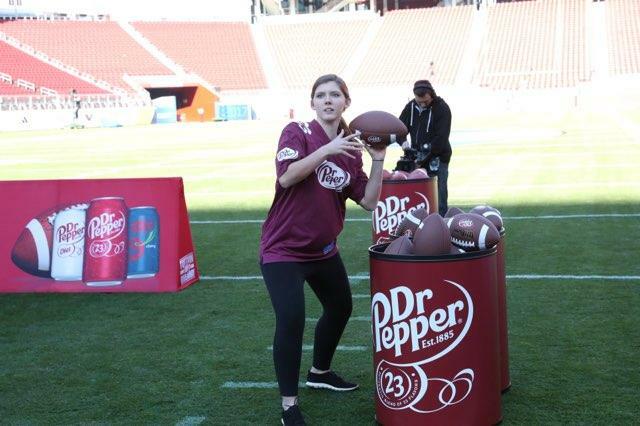 Thompson was chosen as a finalist for the Dr. Pepper Tuition Giveaway – a competition in which students toss as many footballs as they can in 30 seconds into a container shaped like a Dr. Pepper can. Thompson has her eye on dentistry school and says that this money would help her fund that and later open up her own practice. Her ultimate career goal is to start a dental clinic for special needs patients. “They can’t take in normal stimuli and process it. It becomes totally overwhelming,” she said of some people with special needs. While in dental school, Thompson hopes to specialize in pediatric dentistry, which will help with special needs cases. “You have to treat the individual as a person. You have to do it in a gentle way,” she said. During last week’s semifinals, Thompson was surprised with a runner-up award of $10,000.